brings euphoria but the high is followed by hallucinations, paranoid delusions and acute agitation that can take three days to wear off. It has been dubbed the new Miaow Miaow, or mephadrone. According to www.drugs.ie ,"While it has proved difficult to carry out much forensic testing on samples of 'Ivory Wave', of those tested, many have contained the active drug MDPV, along with cutting agents such as the common local anaesthetic Lidocaine. MDPV, chemical name Methylenedioxypyrovalerone (3,4-methylenedioxy) is a Class B drug. It is a cathinone derivative and was brought under the control of the Misuse of Drugs Act in April 2010 along with mephedrone and other related substances." 'Ivory Wave' is generally not available in Irish headshops (as of August 2010). 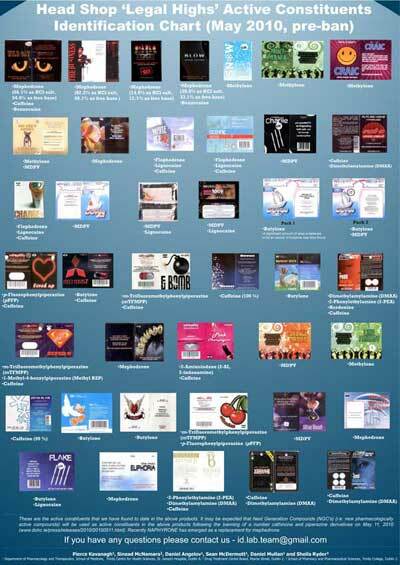 Please click on the image above for print (pdf) version. Further information or queries to the author / designer - Dr Pierce Kavanagh, Department of Pharmacology and Therapeutics, Trinity Centre for Health Sciences, St. James's Hospital, Dublin 8. 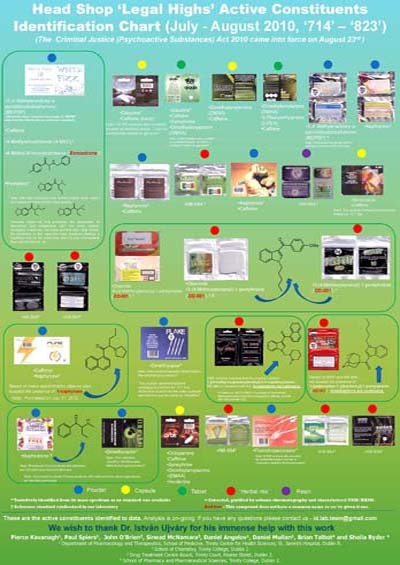 Dr Kavanagh produced the Head Shop ‘Legal Highs’ Active Constituents Identification Chart. Novel and creative ways will have to be found to obtain standards and some key intermediates for syntheses of the new compounds. A re-evaluation of current drugs legislation is required to facilitate researchers. As the cathinones are very easy to make, some thought will have to be given as to whether or not key intermediates/starting materials should also be controlled. We are now looking into what impurities/by-products may be present in the products. And if you have any samples containing unidentified components Dr Kavanagh is happy to have a look at them. HSE Article on Severe adverse reactions to new head shop drug "Whack"
Poisons Information Centre of Ireland "Whack"